Illustration by James HeimerMy grandfather, Henry Fischer, was a master miller in Bavaria when he decided at age 20 to immigrate to the U.S. A classic American immigrant story of hard work and new beginnings, he eventually owned his own moving and storage company in Doylestown, but his passion for water mills remained. In 1947, he bought the run-down Castle Valley Mill property, spent a year restoring the house, and moved his family in. While he never got the mill running again, he continued to make repairs as time and money allowed, and collected mill stones and machinery— including an 1830 rolling screen, 1910 seed cleaner, 1888 disc aspirator and a 1880 Nordyke-Marmon stone mill—from all over Bucks County as mills were torn down or turned into restaurants and gift shops. My father, Robert Fischer, lived at Castle Valley from age 12 until he left for a career in the Air Force and aviation. Though it was his cherished childhood home, milling was not in his future. Fifteen years ago, my wife, Fran, and I bought the homestead from my grandmother, Jean Fischer’s estate when she passed away. We re-restored the house and moved in as the third and fourth generation at Castle Valley. The mill was a big old building full of dirty old machines and in dire need of restoration. I had always fantasized about getting it running, but I was focused on my own business in corporate aviation safety consulting. Life is funny though, and about three years ago when I agreed to a buy-out of my share of the consulting company, I was finally able to do something with the mill. My then 14-year-old son, Curran, and I signed up for miller training classes through The Society for the Preservation of Old Mills, learning all about grist milling in the 1800s. Fran was supportive of our adventure and we slowly started restoring and restarting several small mills and cleaning machinery. We now have two small 12” mills and a medium-size 20” mill running, giving us a capacity of about 1,000 pounds per hour. I pressed my daughters, Deming and Liesel, into service bagging, cleaning or manning the table at farmers markets. Soon we realized that this might be a sustainable family business. There is something wonderfully “connected” about all this. We interface with farmers, high-end chefs, artisanal bakers and history buffs. We work in sync with the seasons and the harvests, each bringing a different set of challenges. We go to bed tired, but deeply satisfied. Our goal from the start was to support our local food shed and farmers by buying our grain locally, cleaning it on the original machinery and milling it as whole grains on the authentic stone mills. Very early on our customers demanded non-GMO products but were flexible about organic as long as it was locally grown. We buy from farmers such as Meadow Brook Farm in Kintnersville, Pa., and small family farms from Lancaster or Chester County. The varieties of wheat depend on who was successful growing what. We encourage farmers to grow heritage varieties that were once common in this region due the their flavor rather than just high yields. Stone milling keeps all the nutritious and flavorful components of the grain (bran, germ and endosperm) thoroughly mixed throughout the flour. Stone milling is like scrambling an egg—all the components of the seed are mixed together. Modern commercial milling crushes the wheat into smaller and smaller bits and sifts out the white starch (called the endosperm), while completely removing the bran and the germ of the seed. 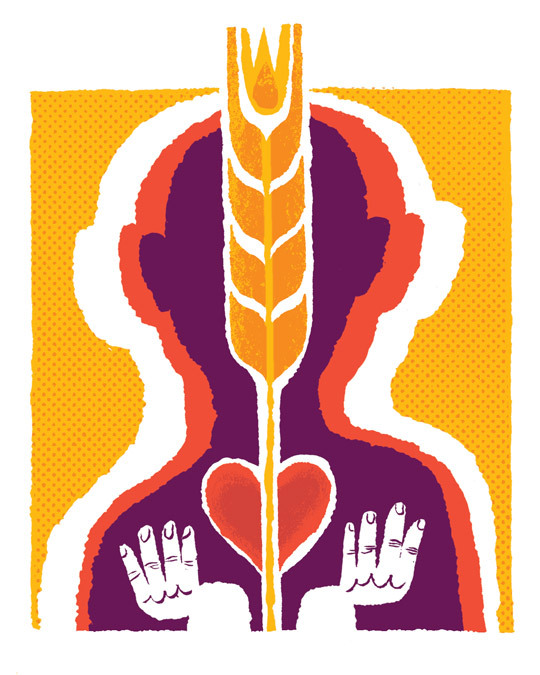 No wonder people are becoming more sensitive to commercial wheat—it’s barely food. Mark and Fran Fischer own Castle Valley Mill in Doylestown, Pa. Learn more about Castle Valley Mill at castlevalleymill.com.